Each member represents one of the nine zones covered by Eduniversal. The Scientific Committee meets twice a year. While there are subtle differences between the methodologies of the different Eduniversal rankings, there are certain criterias that remain constant across all rankings. To determine its rankings, Eduniversal conducts an individual online survey. 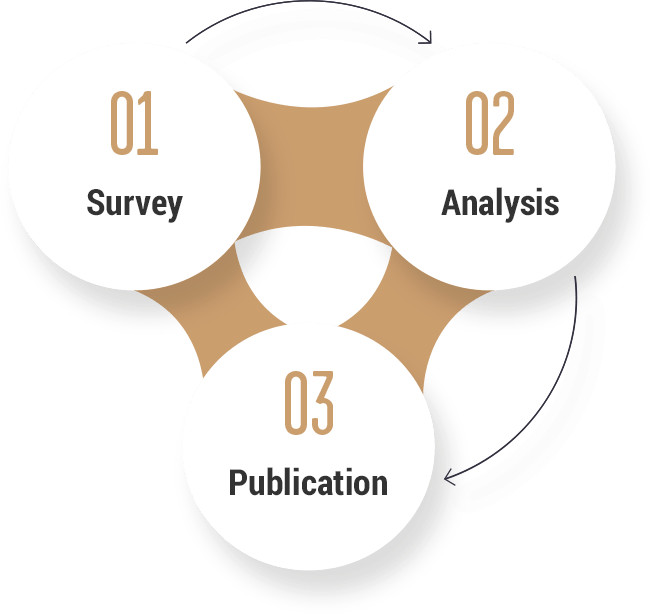 At the end of each Eduniversal survey, the results are carefully analyzed by our teams. The relevance of data provided by program participants is verified. People who have not participated in the programs but who but are well recognized take part in a parallel survey conducted by our consultants. Once the calculations are completed and the ratings determined, the rankings are filed with an independent legal officer and can no longer be modified. The ranked programs are then rapidly informed of their status in the rankings. The rankings may then be viewed on a dedicated website. The French rankings are also published in a printed version. The Guide des meilleurs Licences, Bachelors et Grandes Ecoles and le Guide des meilleurs Masters, MS et MBA are respectively printed in 150,000 and 50,000 copies and distributed in schools throughout France.